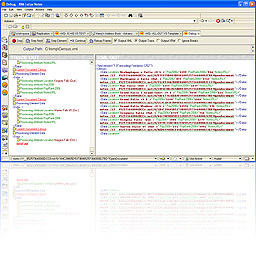 The only XML development environment designed specifically for Lotus Notes/Domino™. <ALL-OUT> is easily integrated into Release 6.5x, 7.x, 8.x or 9.x applications because it is built using native Notes functionality and requires no additional software. Sophisticated XML extractions can be designed and tested using only the Notes client and then deployed to other Notes/Domino applications. Click here to learn more. <ALL-OUT> is an Integrated Development Environment (IDE) for creating custom formatted XML extractions from IBM Lotus Notes databases. Extraction programs can be incorporated into any Lotus Notes or Domino application by including a single LotusScript library. Debug support for stepping, break and resume, trace formulas, back mapping between trace and output. The <ALL-OUT> IDE is targeted at developers and requires some knowledge of Notes development concepts such as views, documents and @Formula language. Once an extraction program is created it can be deployed as part of any Notes/Domino application. <ALL-OUT> drastically simplifies and accelerates the creation of complex XML extractions. It fills the gap between built-in XML generation (DXL, ReadViewEntries, etc.) and custom programming. Feeding XML content to external report writers, PDFs, spreadsheets, etc. Copyright © 2015 Enter Infosystems Inc. - All Rights Reserved.